This book is a combination of three POVs. Chaol, the recovering ex-captain of the king’s guard, Yrene, the healer we met in The Assassin and the Healer, and Nesryn, the current captain of the king’s guard. It was supposed to be a novella but it turned out quite a bit longer and way more indepth. However, my feelings were all over the place here. I found myself not caring about anything but Yrene for a while. The life she has lead and the reason she is where she is, is just insane. She is truly an amazing healer. My heart wanted a novella, so it was stubborn. Chaol. What can I say about him. There’s a lot under the surface that he needs to deal with before he can move on and heal properly. And while he’s trying to heal, he must convince the khagan to give them support and deal with the utterly crazy royal family. And I mean crazy in a somewhat good way. Never a dull moment. Nesryn actually gave me the only scene I teared up in. I didn’t think I was going through care about her storyline but I did. I’m glad she found what she was looking for. I hope nothing happens to her in the next book. I’d be very upset. This story gives us a few answers to questions we’ve been asking. And also gives us quite a few new discoveries. It makes me rather anxious to get to the final book now. I do wish that there was a little more from Chaol’s past though. We see snippets but not enough, in my opinion. 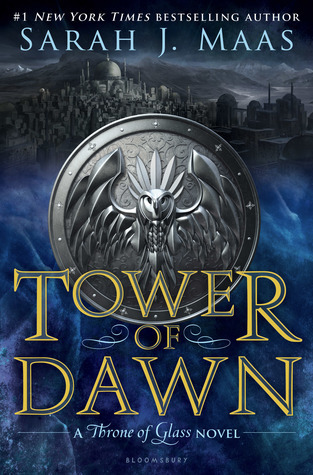 This takes place in the same timeline as Empire of Storms and we do get a few glimpses into what’s happening with Aelin and the rest of the crew. As for the YA/NA jump, ToD had a few scenes that were definitely not in the young YA world but less than the full on NA. So be prepared. I did block a few parts off since my kids aren’t ready for that. Now the only thing I have a problem with was the usual changing of the loves. Sarah has a habit of getting us invested in a couple, only to have them break apart a few books later. She does this in both her series. While I love her stories, it hurts to get invested in a storyline, only to have it shattered later on. I need to seriously think about taking another chance in her future series. My heart can’t take this.